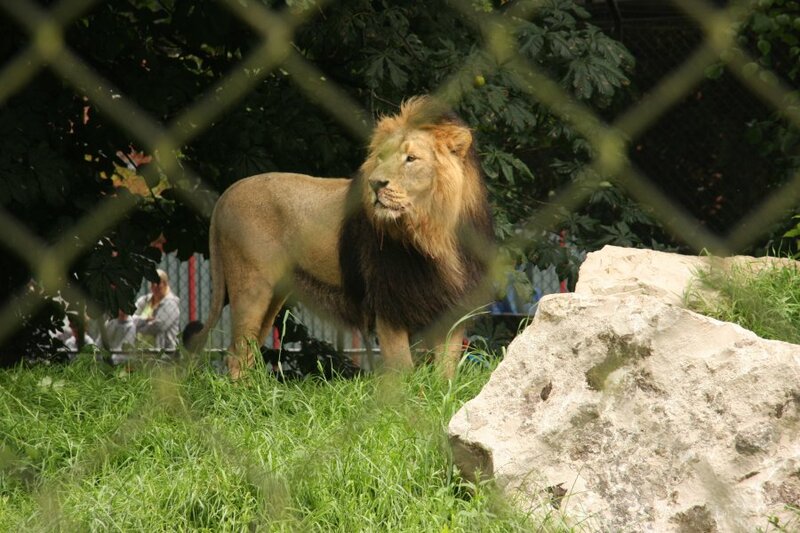 One of the World's highest regarded zoos. This is part three of a series of three galleries, from a multi-part holiday taking in three completely unrelated destinations. Part 1 (Lake District) and part 2 (Isle of Man) can be viewed separately. 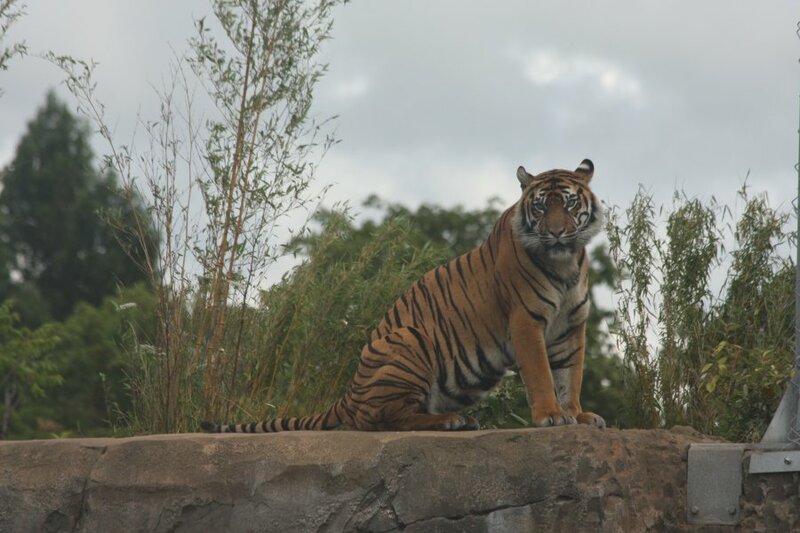 Chester zoo is one of the major British zoos, regularly voted as one of the best in the World, and the best in the UK. In terms of space, it has less than Whipsnade. 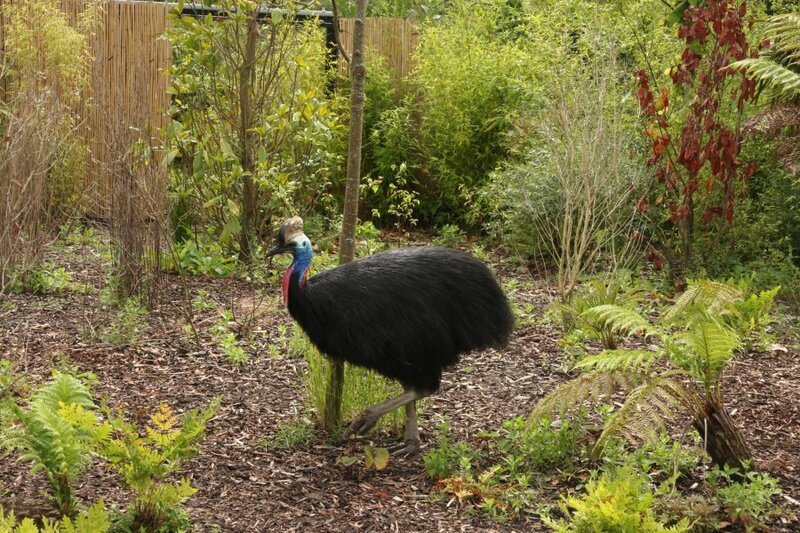 In terms of species, it has fewer than London Zoo. In terms of actual animals, it appears to have more than any other in the UK. 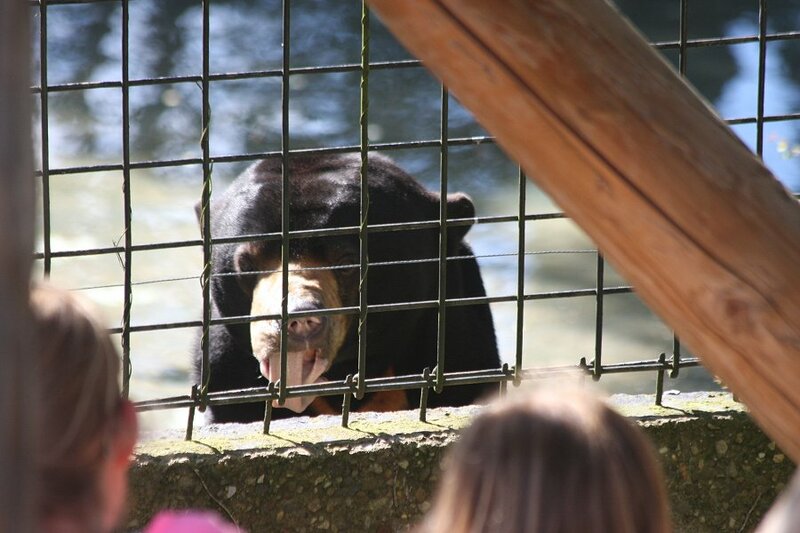 The enclosures and the selection of species are some of the best that can be seen. 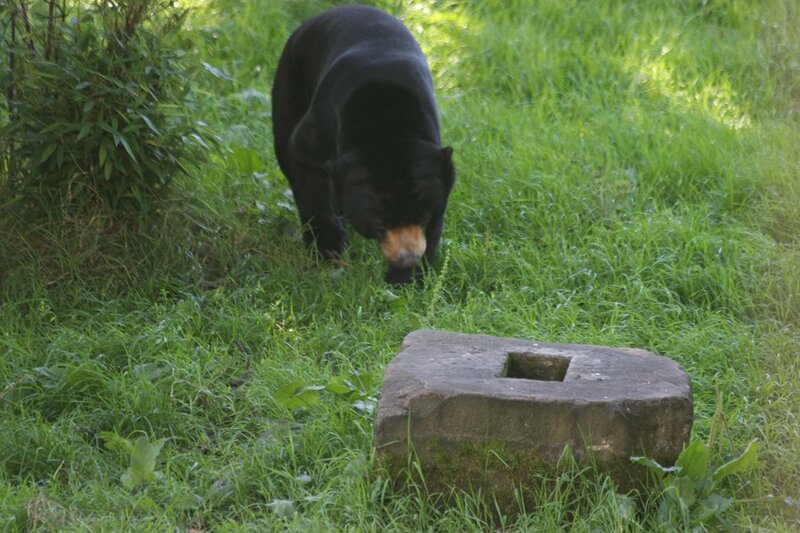 It is also the most visited zoo (or wildlife attraction of any kind) in Britain. 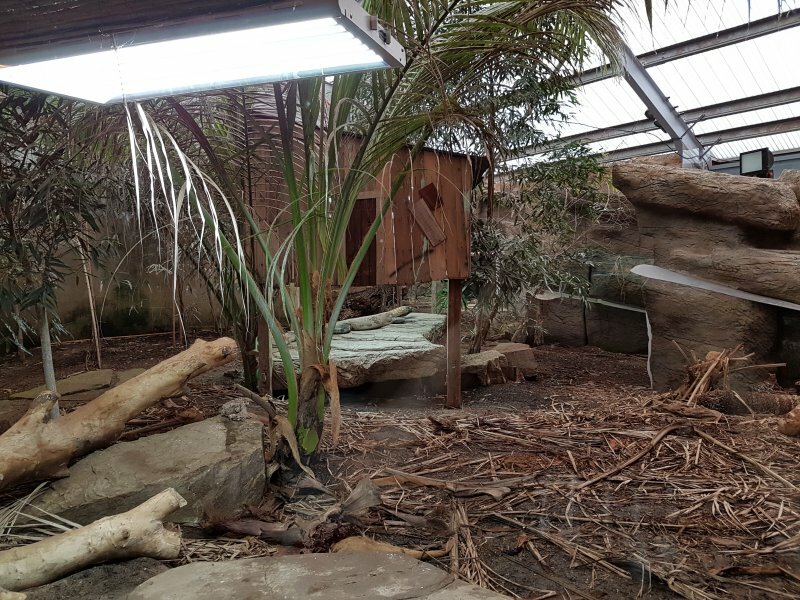 In particular for me, the zoo has some of the finest reptile enclosures I have seen in a zoo, and a great deal of effort seems to have gone into making sure that the heating and lighting are done in the best way possible. Sadly this was only a regular tourist visit, and not a behind-the-scenes tour, but the quality of the setups and the conservation work that goes on here was still very clear. 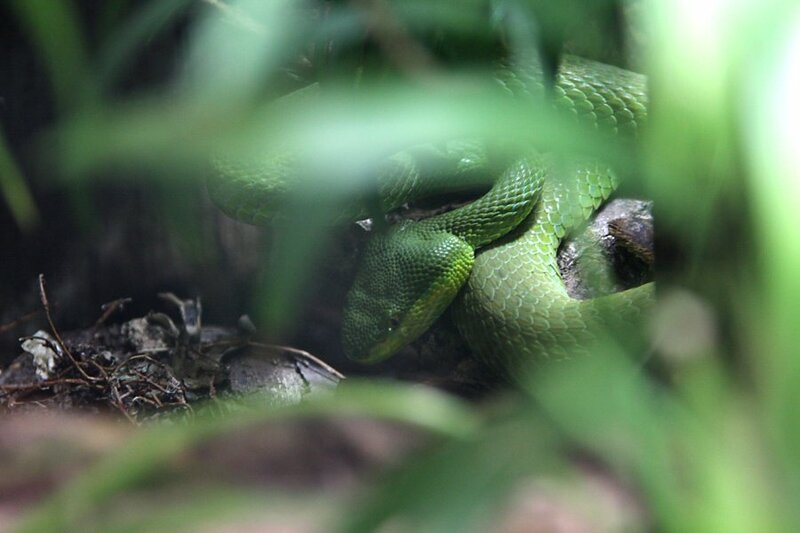 Behind the scenes there are apparently far more reptiles, including anacondas, cobras, mambas and several pit vipers. 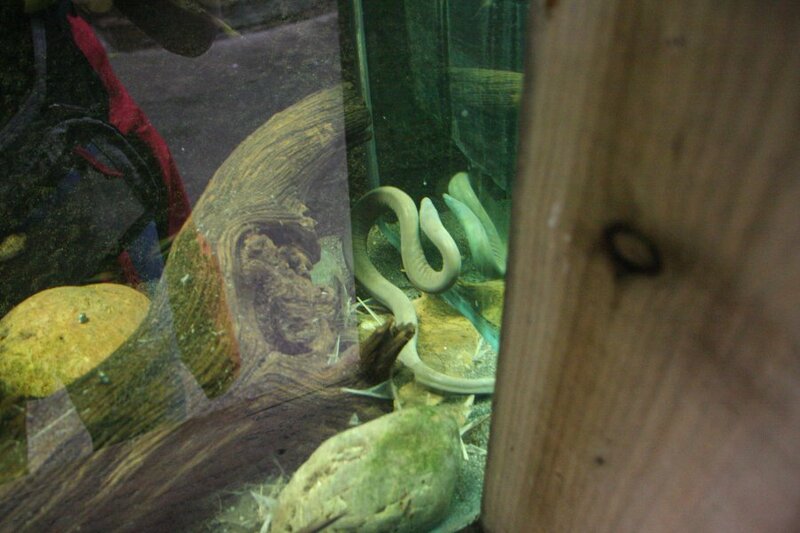 The layout of the zoo makes it rather difficult to know if you actually saw everything you could see, since the animals of any kind may be scattered throughout severals sites without any obvious pattern - snakes, for example, are located in multiple unrelated buildings. We probably missed lots. 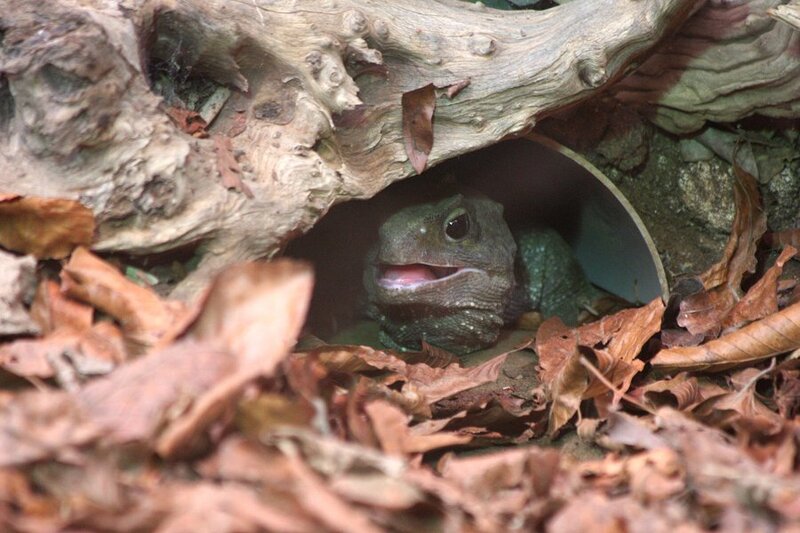 Tuatara. 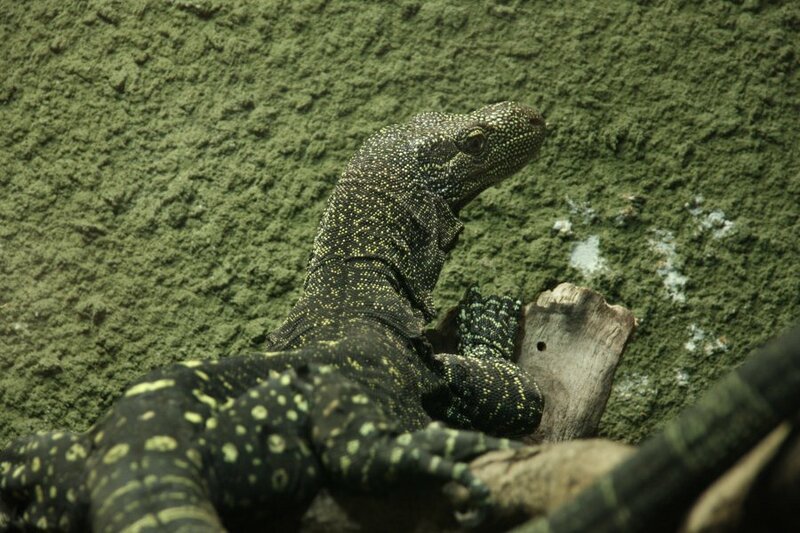 Tuataras share a lot of features with lizards, and look quite similar to iguanas. 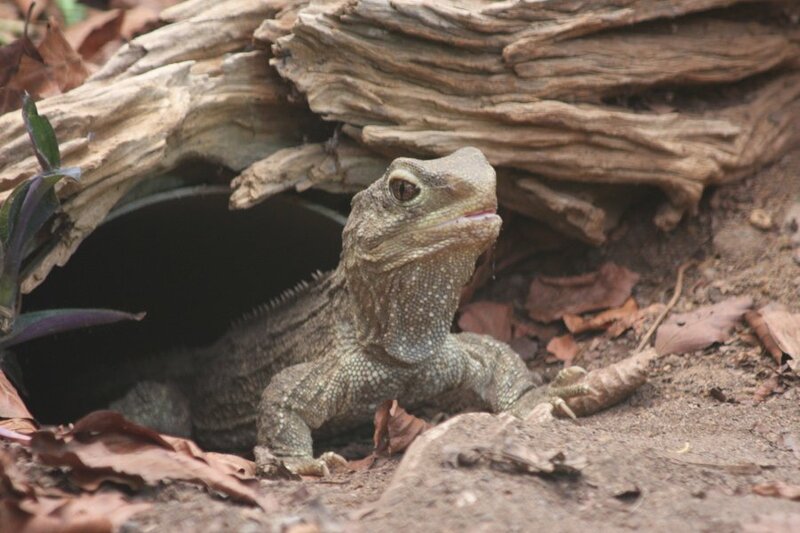 Like iguanas and many other lizards, they have the third eye in the top of their head (used to detect day/night seasonal changes), which is quite large in the tuatara. However, they have a unique double row of top teeth, one row fitting either side of the bottom teeth when they close their mouths. 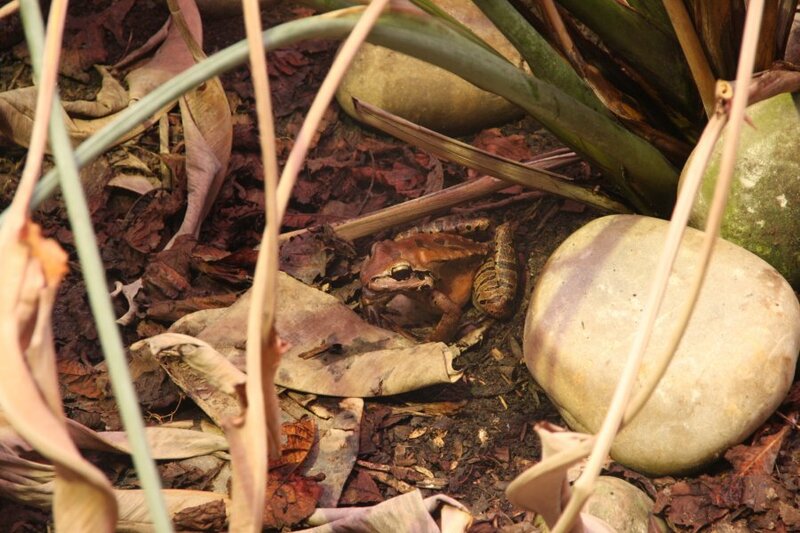 Also, unlike all other living reptiles, they mate using a cloacal kiss, like birds, rather than using the hemipenes of a lizard - something that very clearly identifies them as not being a lizard. They are the only members of a family of reptiles that branched off just before the development of lizards (in the same era as the earliest dinosaurs), 225 million years ago. 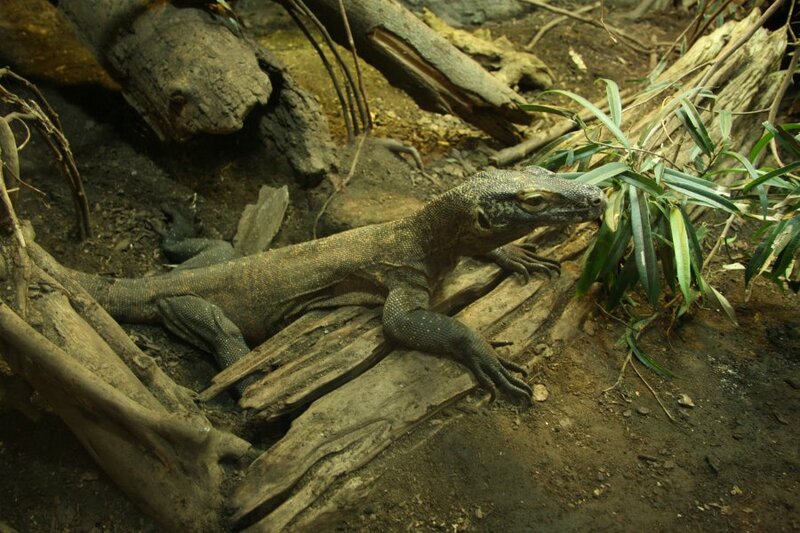 Tuataras have changed very little - compared with other reptiles - since they first appeared. The dinosaurs emerged, diversified into thousands of forms, branched into birds, and mostly died out - with the birds futher diversifying extensively. All along, tuataras stayed as tuataras. Around the time that the dinosaurs disappeared, the tuataras became confined to New Zealand. Rats are their main threat now, and it is only because of very careful conservation efforts, and removal of the introduced rats from many islands, that tuataras are not currently endangered. 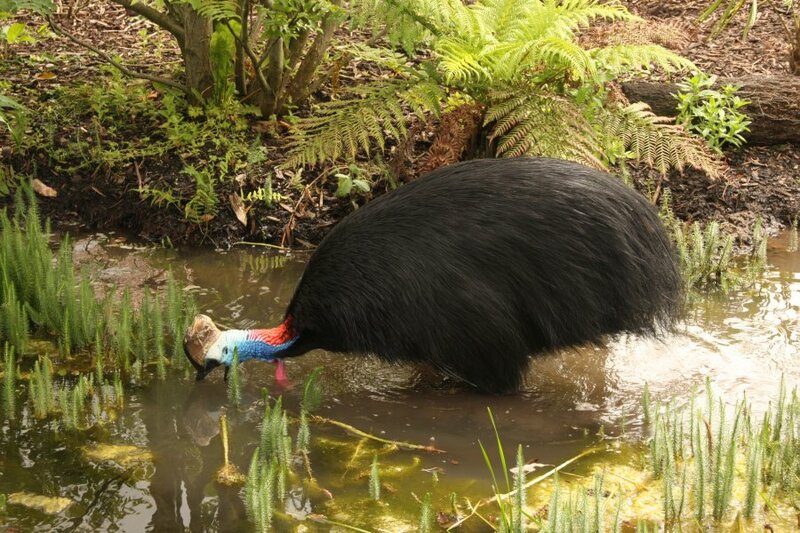 They are still very heavily restricted, and are not available in the regular pet trade, due to their challenging care requirements and extremely slow reproduction rate..
Outside of New Zealand, tuataras can only be seen in 6 zoos, and only 2 are expected to make good progress in stable breeding programmes. 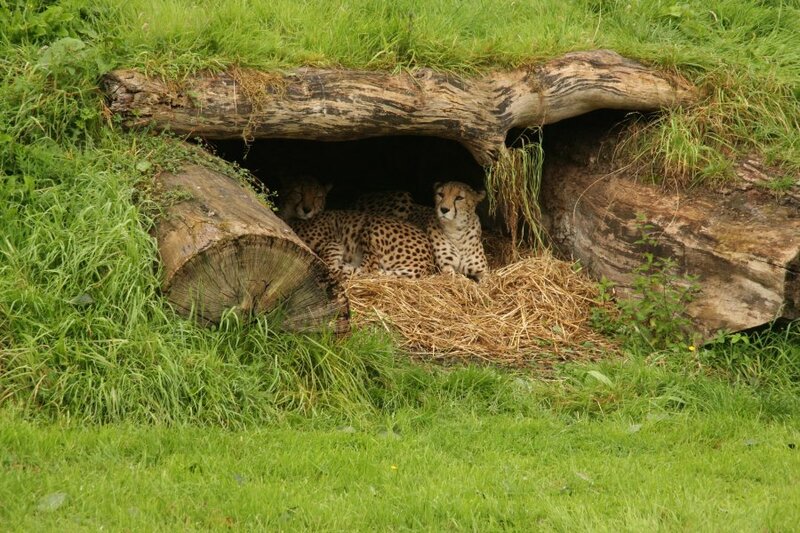 Chester Zoo is the first to have successfully bred them outside New Zealand, after a 12 year programme. 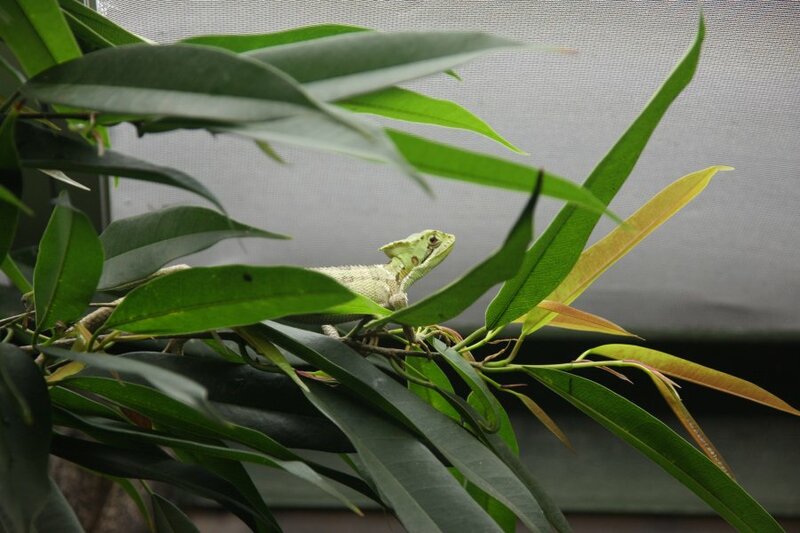 These are listed as the northern tuatara species, but almost all tuataras outside New Zealand are actually the Cook Strait subspecies of tuataras (San Diego is the exception, which has Brothers' Island tuataras). 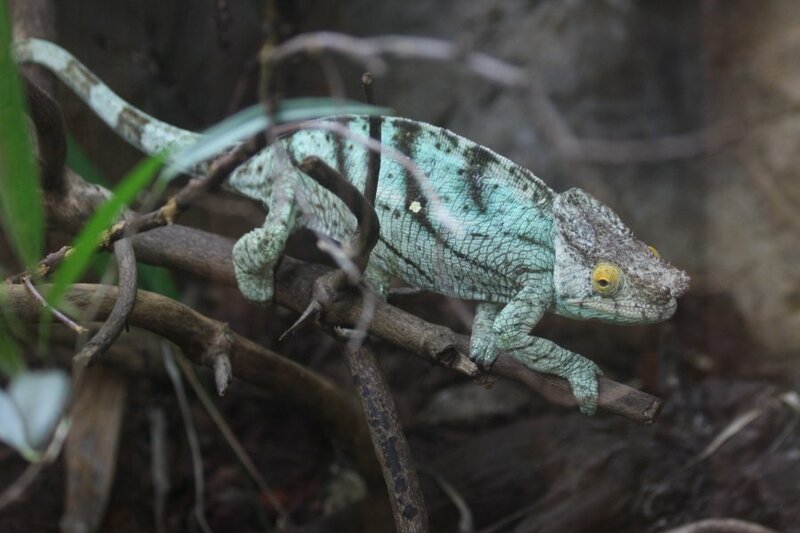 They can live an exceptionally long 120 years (nearly twice as long as the longest-lived lizards), reaching adulthood at 20, and one fathered hatchlings at the age of 111. 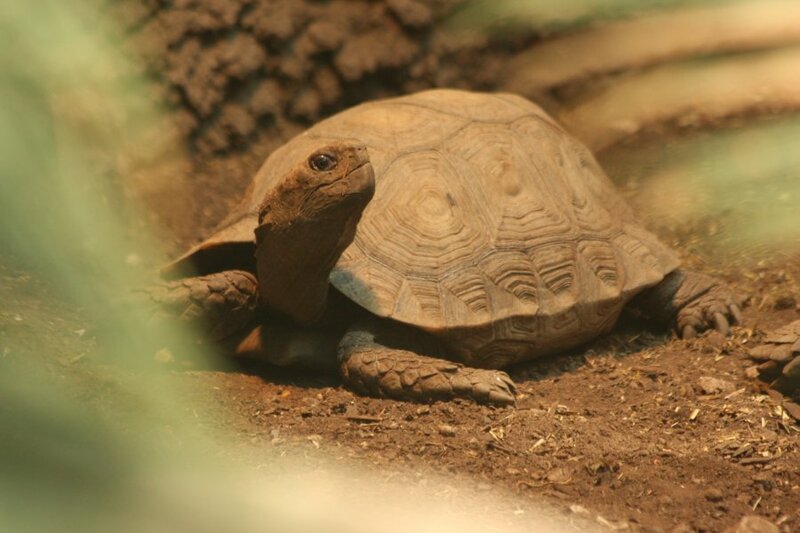 Galápagos tortoise, the largest tortoise species, and one of the inspirations of Darwin's work on the Galapagos Islands (covered in more details in the London Zoo gallery), due to their adaptations to each island. Again, this appears to be a low-arched-shell version. 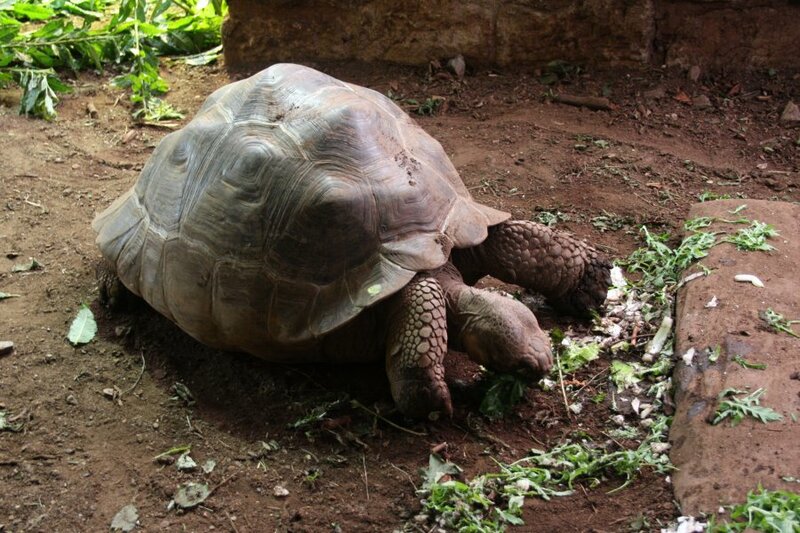 The Galápagos tortoise (shown here) looks very similar to the Aldabra tortoise, and they are similar sizes. 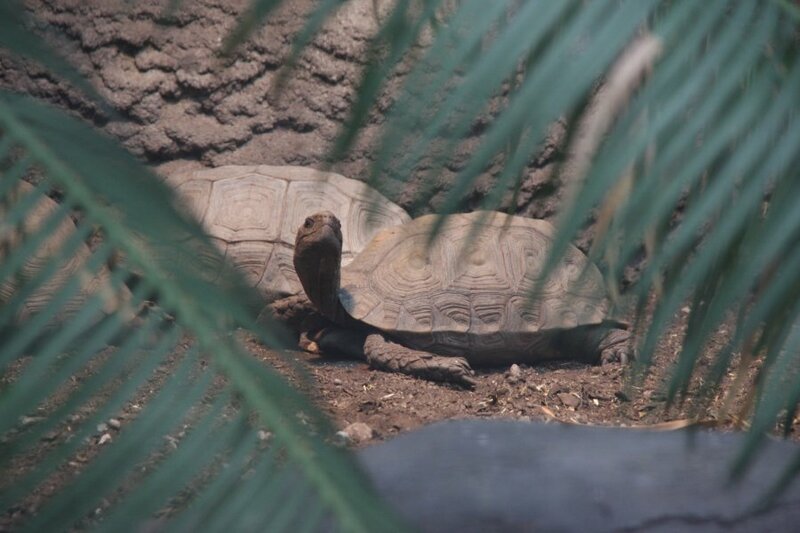 98.66% of Aldabra tortoises have a nuchal scute (small central scute between the marginal scutes on the shell above the neck). 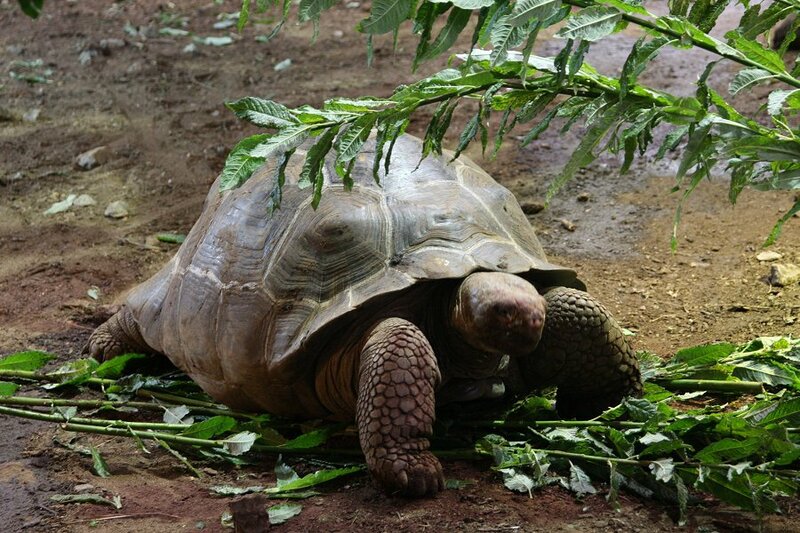 The head of a Galapagos tortoise is wider and fairly flat on top, with nostrils level with the eyes. 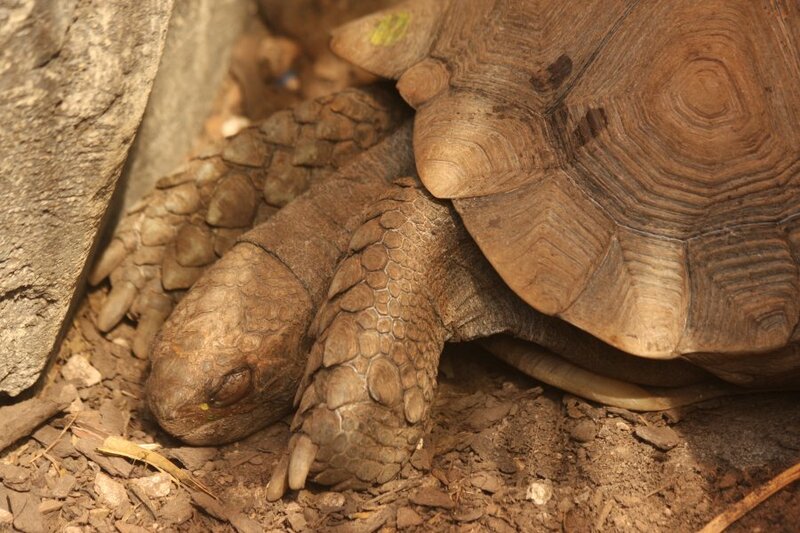 The head of an Aldabra tortoise is smaller and narrower, sloping down to the nose, with nostrils lower than the eyes. Radiated tortoises from Madagascar, with some showing a blotchy pattern, like the shell colours have worn off. They all have the characteristic lack of horizontal rays on the side scutes and lack of longitudinal rays on the dorsal scutes. 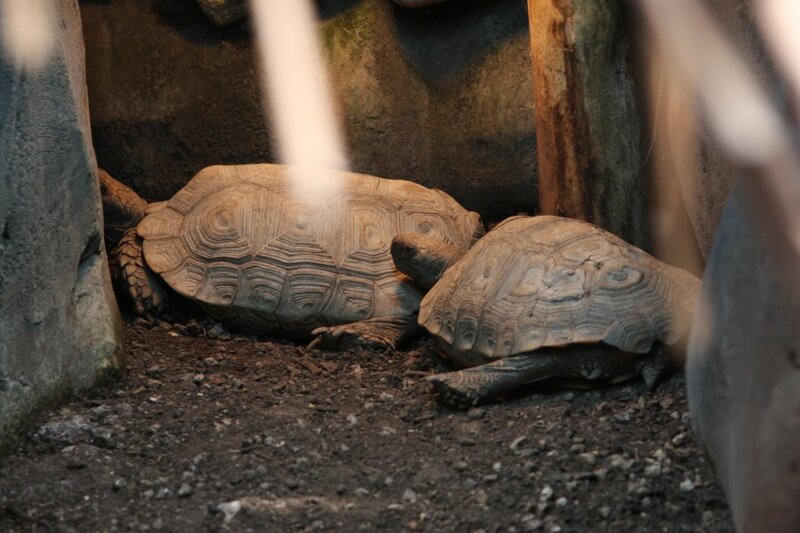 However, they all have very dark heads and arms which are more characteristic of the Indian star tortoise. 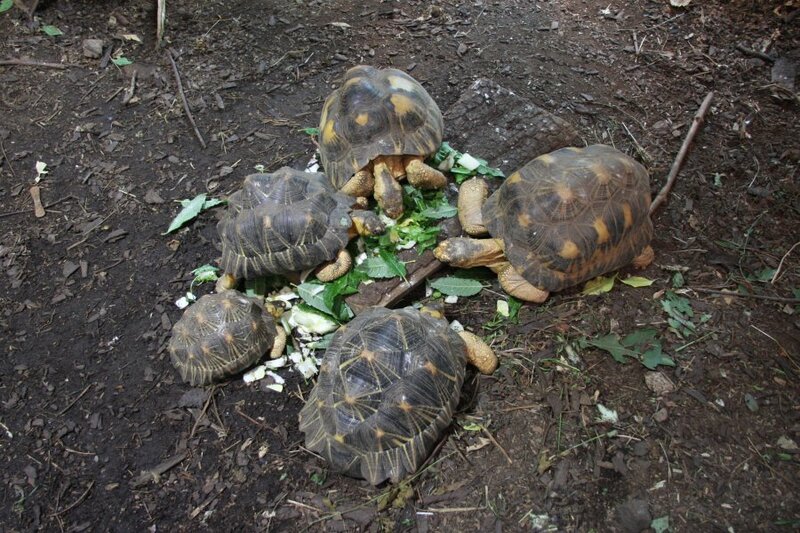 Asian forest tortoises. These are an endagered species from southeast Asia. 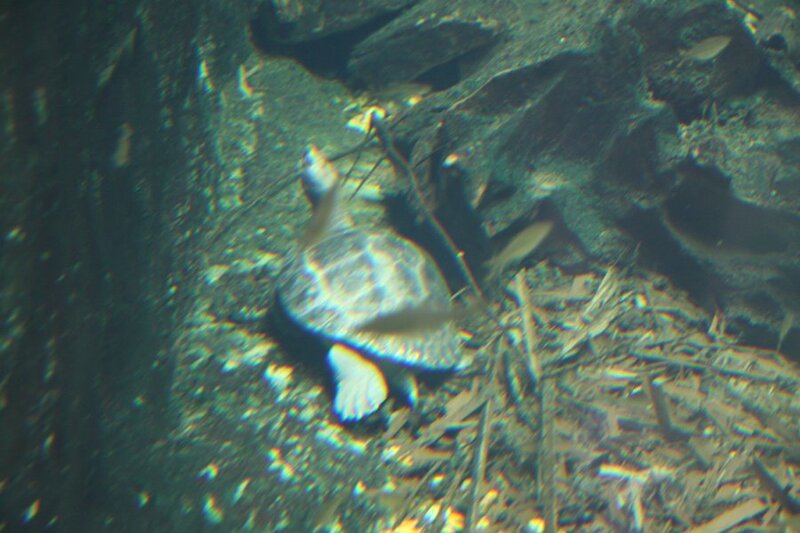 These appear to be the Phayre subspecies, according to the zoo's range map. It is possible for these to reach 35 kg or more, which is quite large for a tortoise. Yellow spotted Amazon river turtle, a side-necked turtle (turns its head sideways instead of retracting it into the shell). 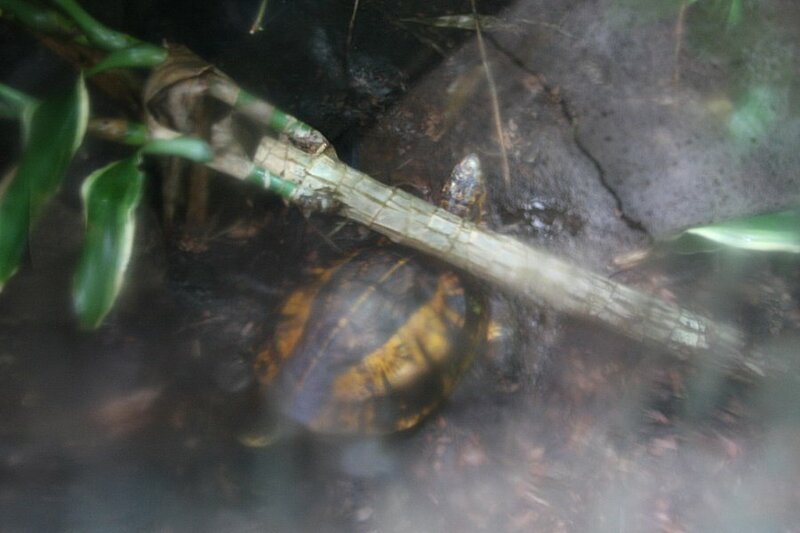 Indochinese box turtle in a fogged up enclosure. These come from southeast Asia, and are part of a breeding programme for the critically endangered species. Their plastron (underside of the shell) is hinged so it can bend upwards at both ends to completely close off the openings when the turtle pulls into its shell. 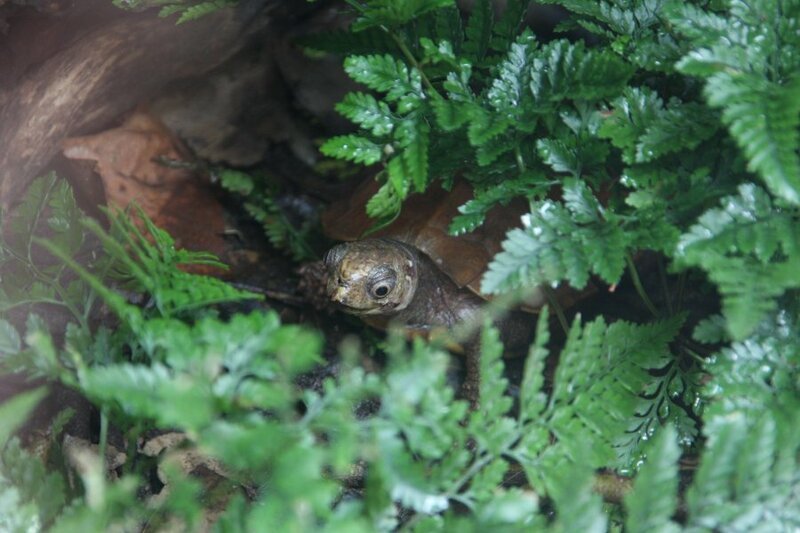 Black-breasted leaf turtle, a tiny endangered southeast Asian species. The oddly shaped beak is a climbing aid. 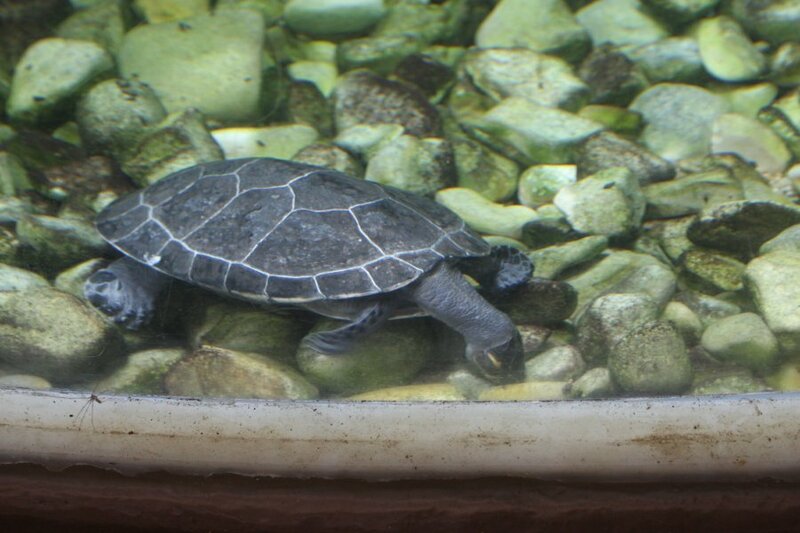 Bornean river turtle, from several parts of southeast Asia. 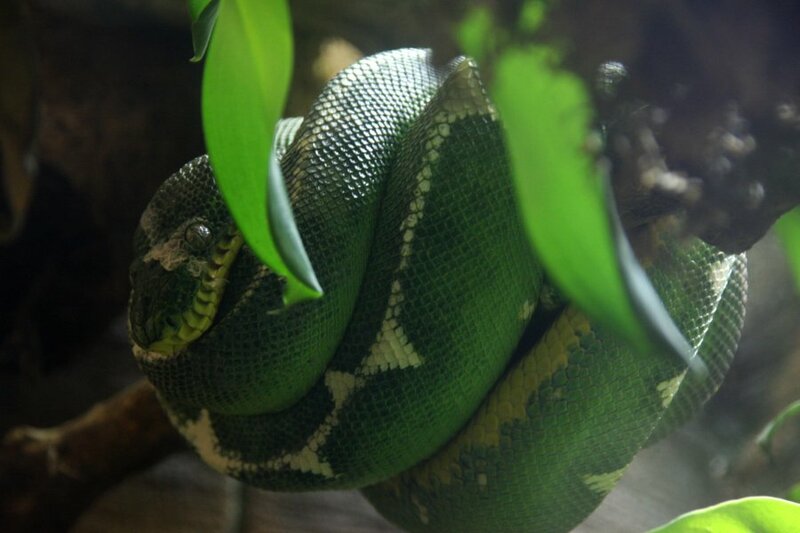 Emerald tree boa, from South America. 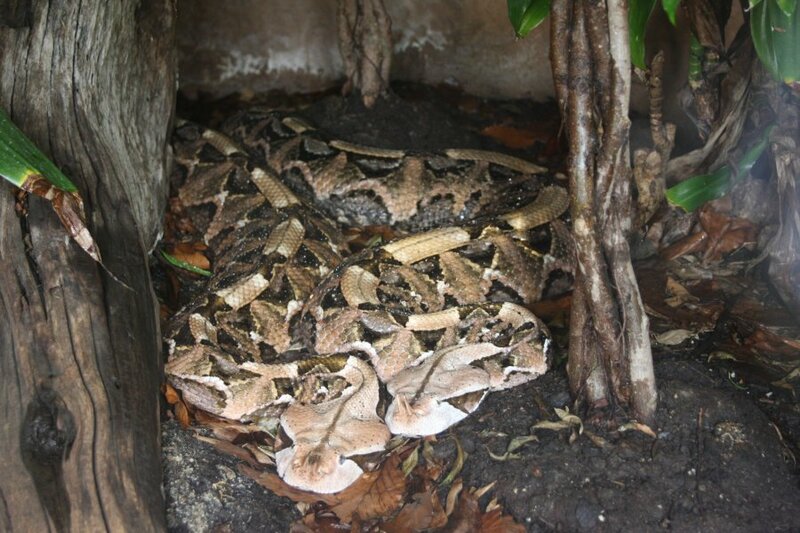 West African Gaboon viper - the subspecies with large nose horns. These are the heaviest viper (but not the longest). The venom is relatively weak, but makes up for it with the largest venom yield of any snake - enough in a single bite to be fatal for nearly 70 humans. The fangs are the longest of any snake, at up to 5 cm long. They are easily long enough to pass through the bottom of the snake's mouth if not folded up properly, and can therefore bite a handler through the snake's own skin. Potentially, they can even pierce up beside the jaw joints, where a handler might choose to hold the snake to restrict its movement. Fortunately, they are actually quite gentle, and rarely bite - normally only biting if stood on. They do not normally flee from an approaching person or predator. White-lipped viper, a pit viper species from southeast Asia. These are venomous, as with all vipers, but their venom is not normally enough to kill a human. 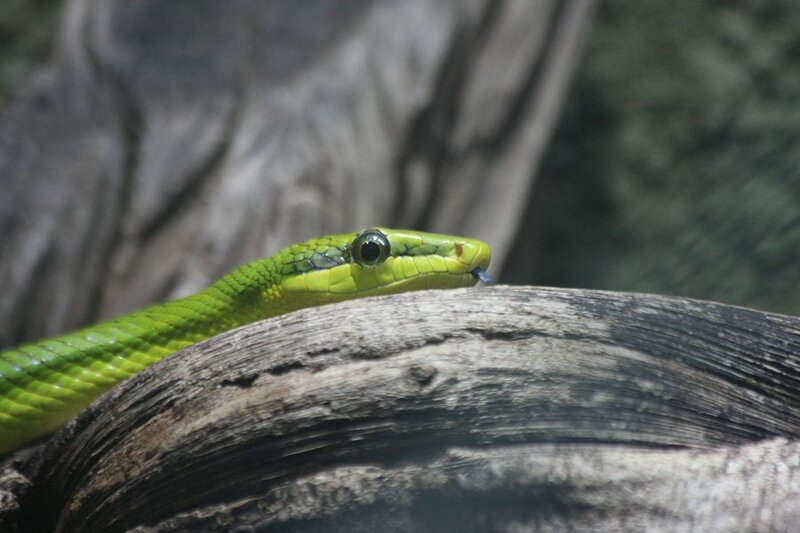 Red-tailed racer, a popular zoo snake from southeast Asia. Harmless and arboreal. Boelen's python, from southeast Asia. 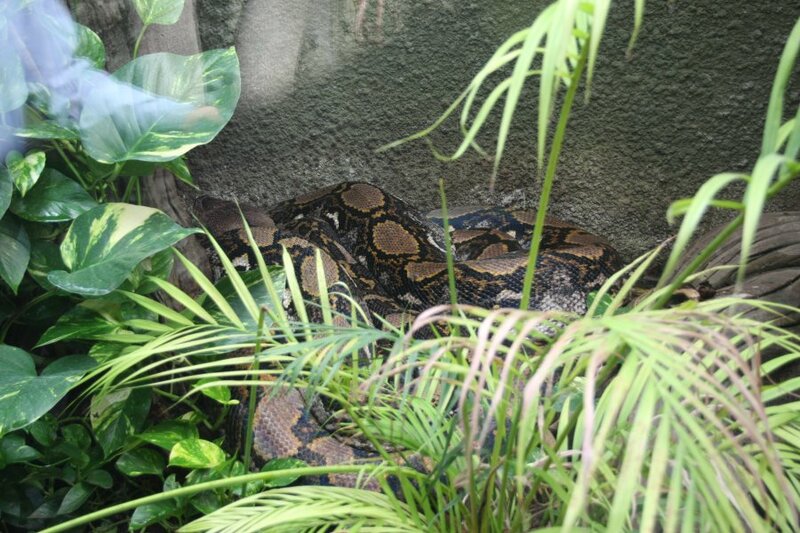 Bali, the reticulated python. 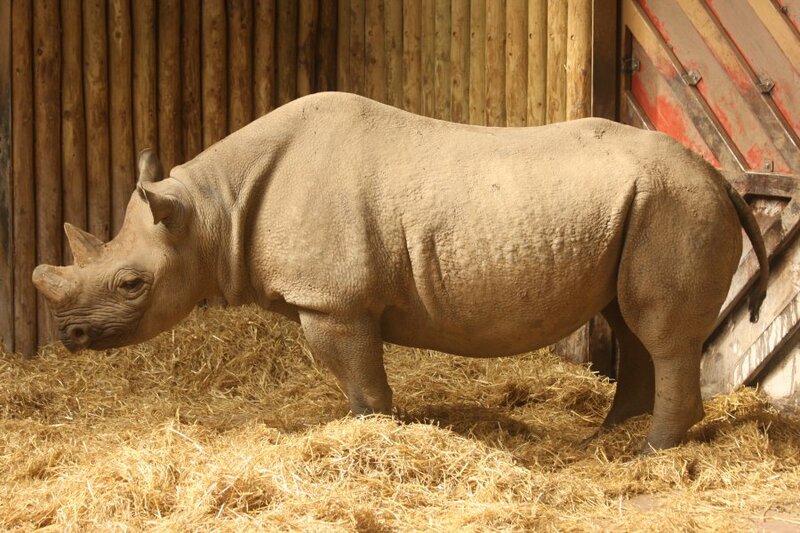 Her longest measurement mentioned on the zoo's website is 23 feet (7.01 metres), and they usually state her weight as 90 kg, more accurately 88 kg in 2010. Her length makes her the longest known snake in all of Europe. The lengths of such snakes is often grossly exaggerated and notoriously difficult to measure accurately (search for Serpwidgets if you want to do it accurately), but she is absolutely huge. Her head (back-left corner) is similarly enormous - see the reflection of a passing visitor's hand for comparison. JF, the smaller reticulated python, at a mere 4.6 metres (15 feet) and 60 kg. 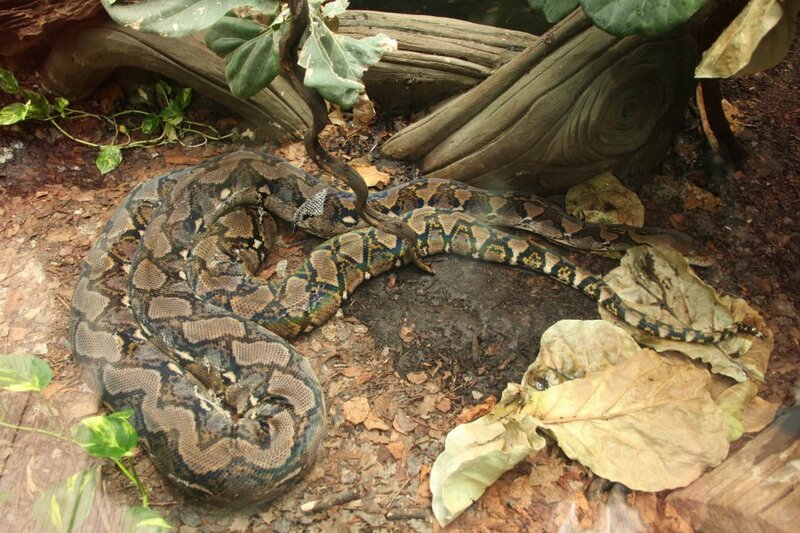 This would be large for a typical pet reticulated python. Both of these are surpassed by others elsewhere, such as the USA's 7.67 meters (25 feet 2 inches) and 158.8 kg of Medusa - the longest and heaviest currently living reticulated python - and the USA's 7.9 metres (26 feet) and 124.7 kg of Samantha - the longest recorded reticulated python in captivity, and the longest reliably measured snake. 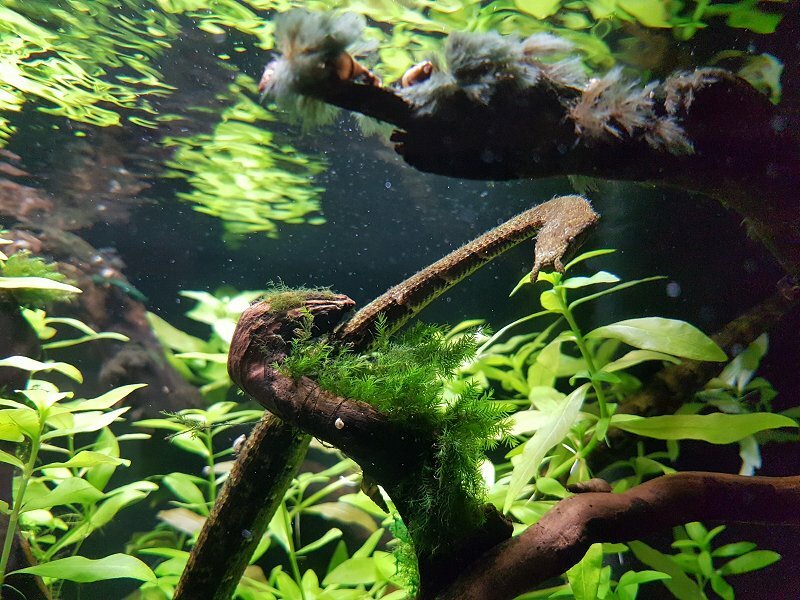 Tentacled snake, apparently the blotched version, swimming upside down. 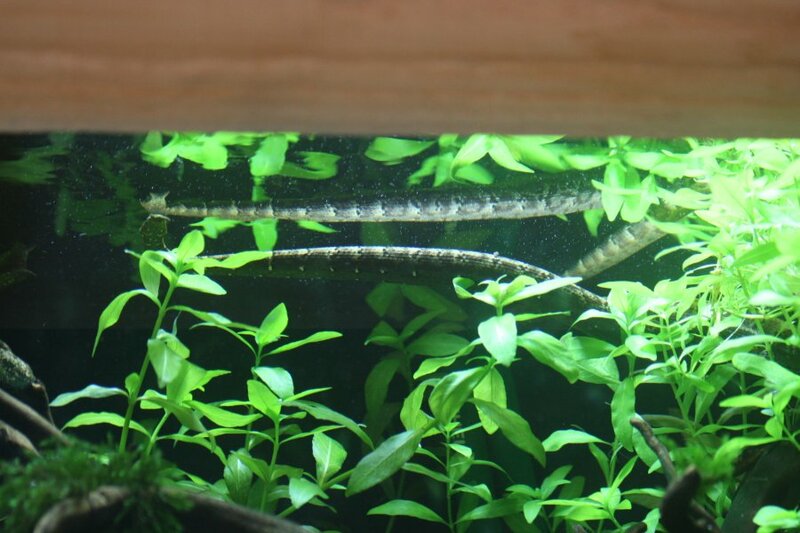 This is a totally aquatic snake from southeast Asia. Despite being technically venomous with tiny rear fangs, the venom is not dangerous to humans, quite common among rear-fanged colubrid snakes. The nose tentacles have a sensory function that is not completely understood. These snakes are being bred at the zoo. The characteristic inverted J pose used for hunting. When a fish passes, the snake twitches to fighten it into a better position, and the snake then strikes at the position it expects the fish to flee to - most snakes can only strike towards the current position of their prey and follow the prey if it moves - retracting their eyes into their head for protection during the strike. Cone headed lizard (also called the serrated casquehead iguana), a tiny green iguanid from Central America. Unusually for a zoo, Chester has a sand lizard enclosure. 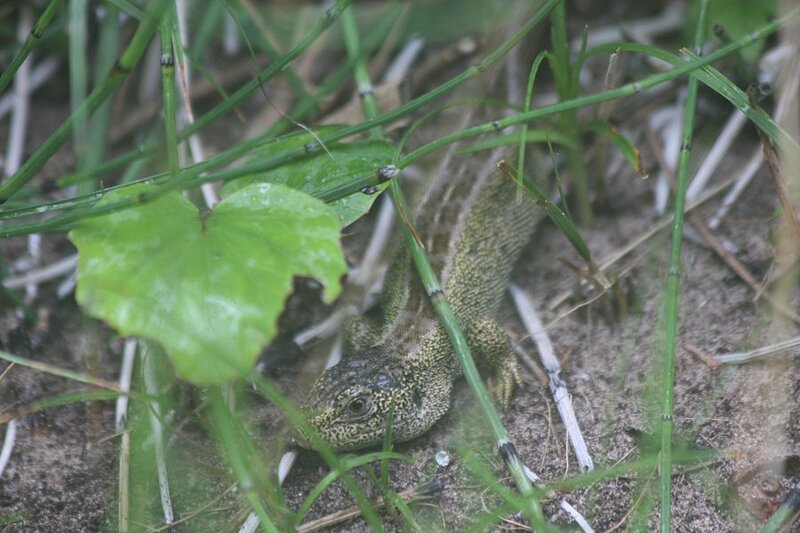 These are a Eurasian lizard. The rarest of the British native species; within Britain they are found only in a few isolated locations, and are very heavily protected. 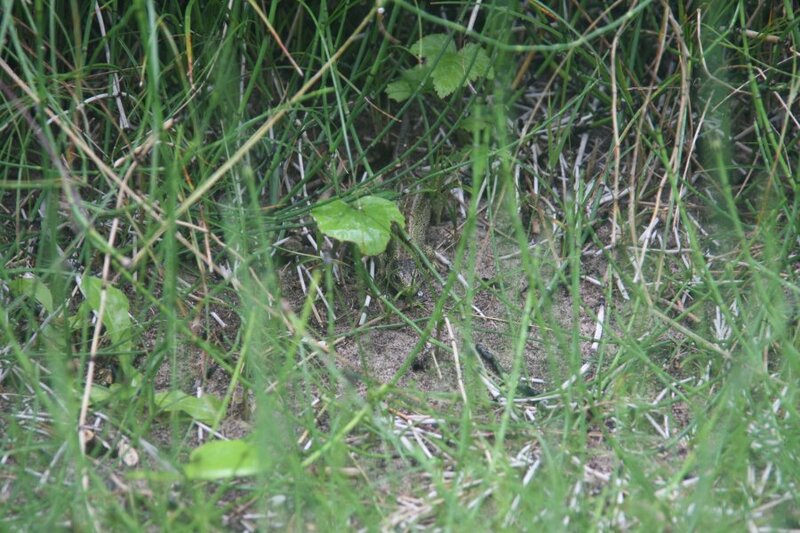 Primarily found in sand dunes, hiding along the edges of the dune grass, and very difficult to spot. The faint green of this one implies that it is probably a male in non-breeding season colours; they are much greener in breeding season. Females are always brown. 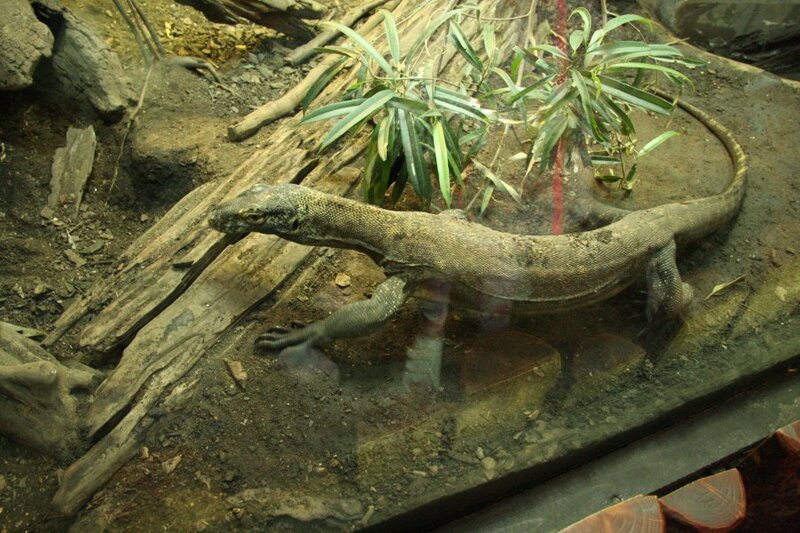 Komodo dragon, the heaviest lizard and typically the longest (but not the longest on record). These are from Komodo island in southeast Asia. 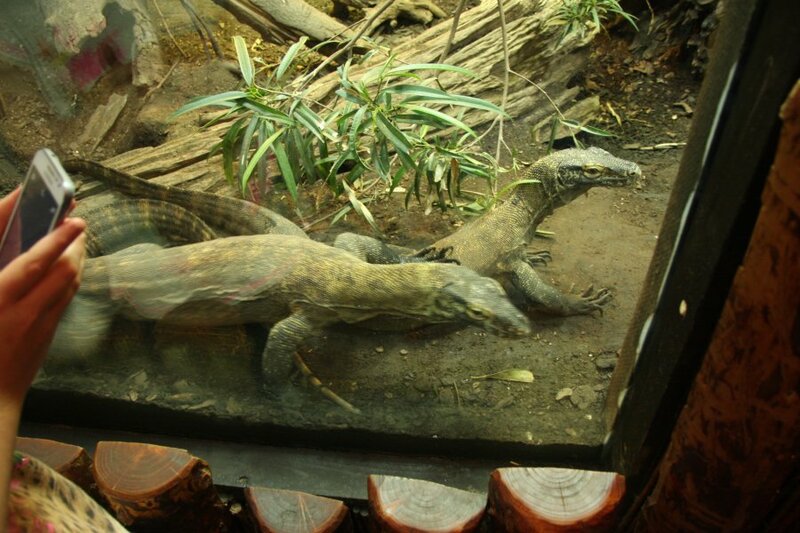 The awesome Komodo dragon setup, designed to look like its native island. UV lighting is provided by a powerful light array near the camera, and another is hidden under the wooden hut. The ceiling appesrs to be made from UV-transmitting plastic, allowing natural UV from the sun as well (British though, so not as strong as its natural habitat, and a significant percentage is lost by the plastic). 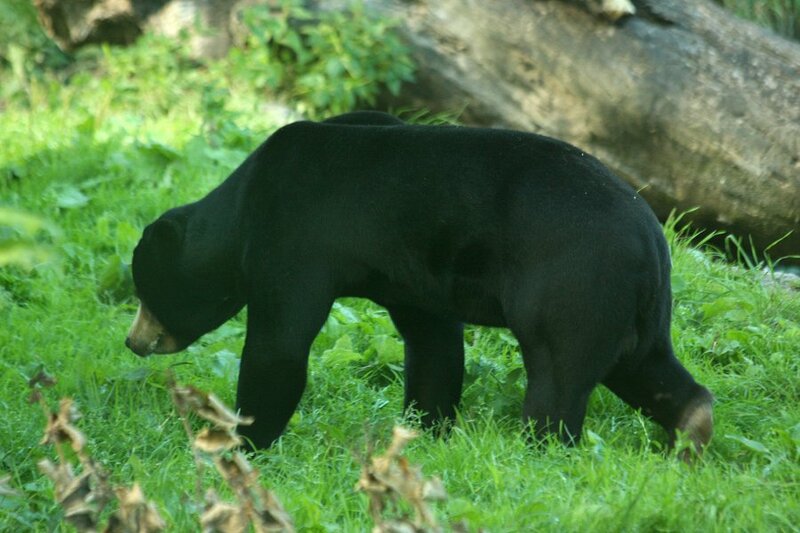 This is the adult male, who had previously lived here with his sister, until he attacked her. She is now kept out of public view. Attacks from these fearsome predators can be very dangerous, with their bacteria loaded mouths, serrated teeth, and venomous saliva. 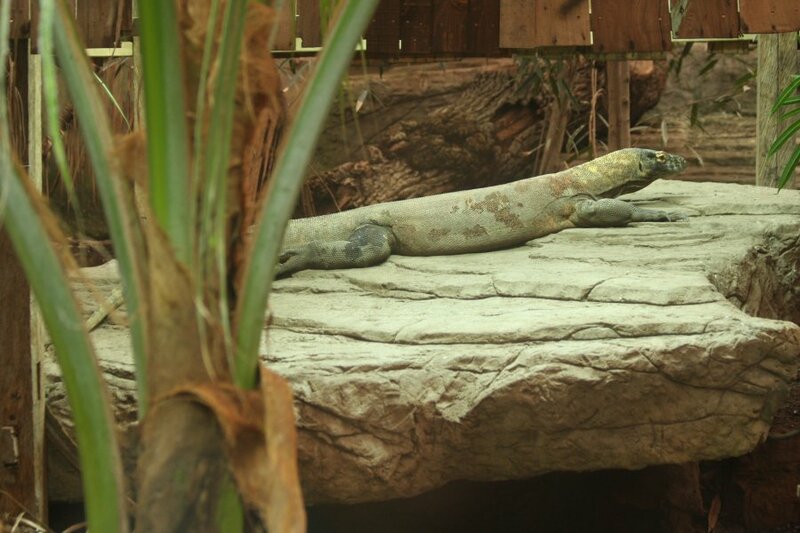 One of the three juvenile Komodo dragons, resting away the day. And that's it, rest disturbed, I'm leaving. 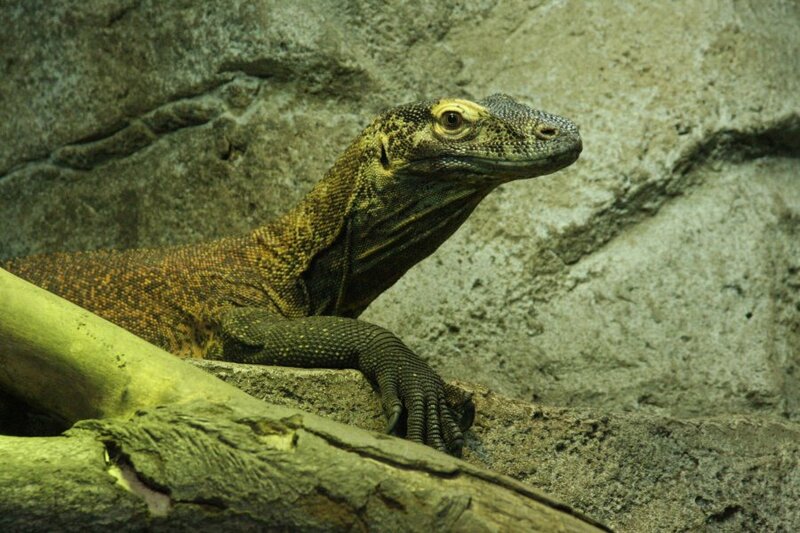 The third juvenile Komodo dragon just watches on, smirking. 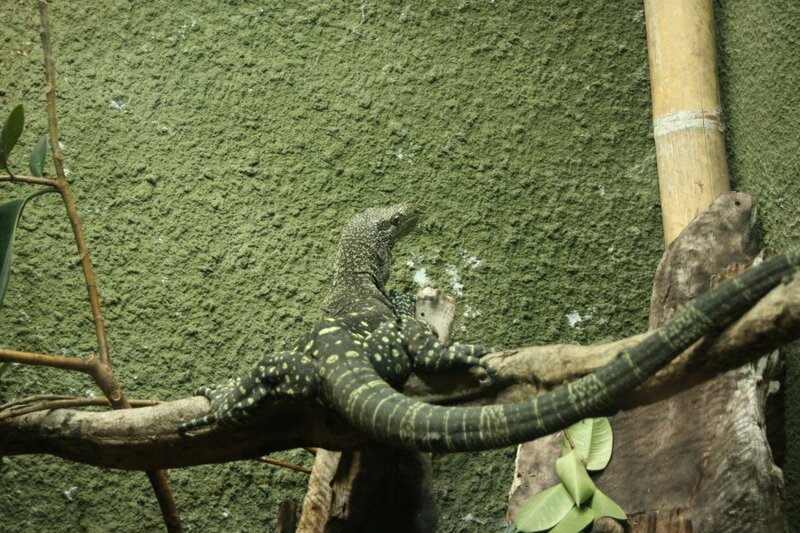 Crocodile monitor, from New Guinea. 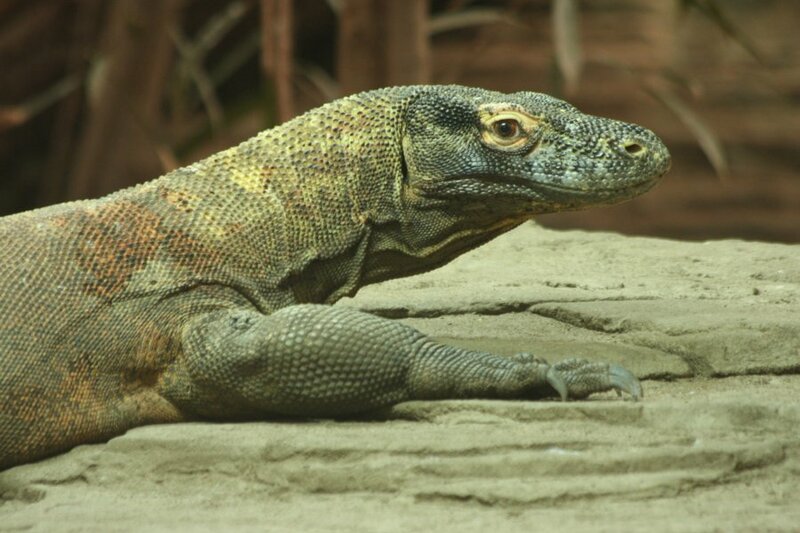 Though they are typically shorter than an average Komodo dragon, these hold the record for the longest measured lizard. Normally quite gentle in captivity - like most monitors - crocodile monitors are known for occasional surprise attacks on keepers that can leave deep gashes, due to their long, serrated teeth. False gharial, a southeast Asian crocodilian that is neither a true crocodile nor an alligator - the teeth interlock more than a crocodile's. 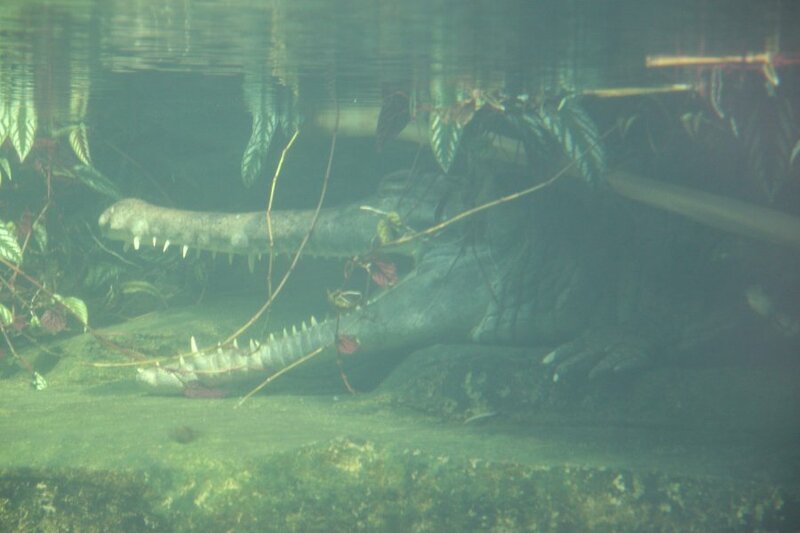 Their narrow snout - which widens briefly at the tip - is relatively weak (they mostly catch fish), and prone to damage, but the false gharial's is somewhat stronger than the true gharial's. 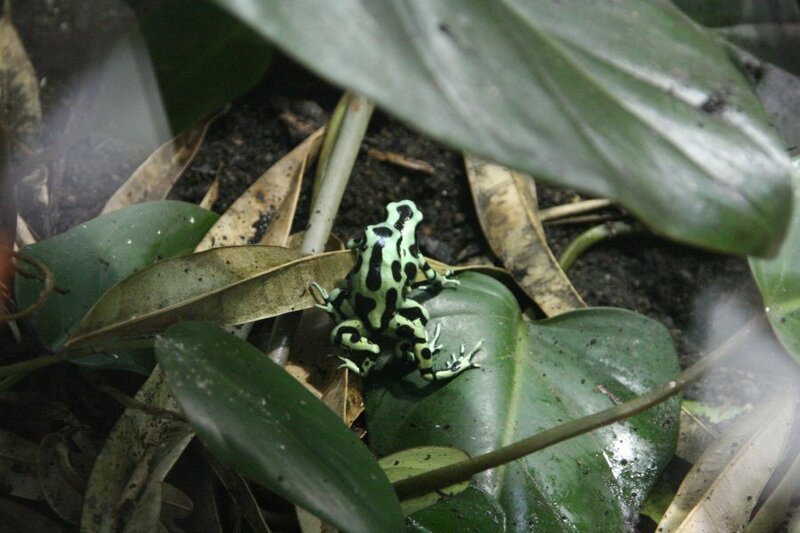 Green and black poison dart frog. In the wild, these would be poisonous due to the toxins they collect from their insect diet - in captivity their food is not toxic, so neither are the frogs. Frogs do not mate. This is amplexus; where the male tries to get carried around until the female releases eggs, which he fertilises outside her body. 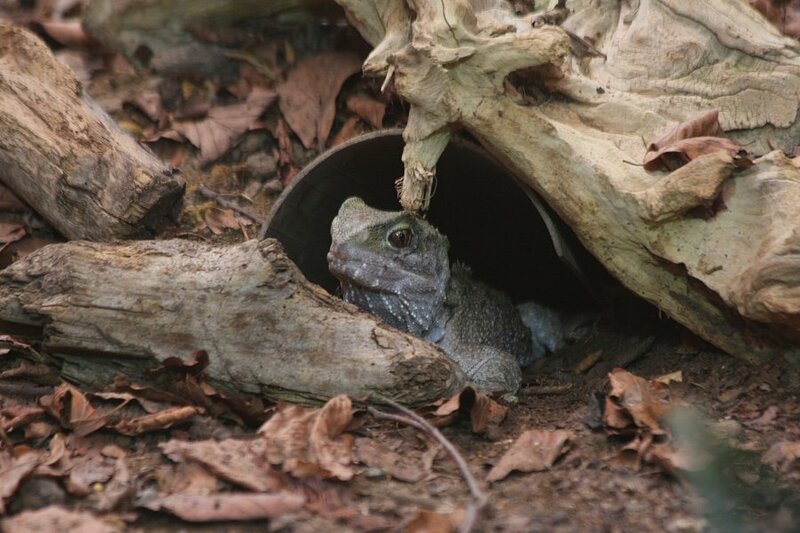 Mountain chicken, an enormous frog from the Carribean, critically endangered due to human activity, natural disasters, and a fungal disease initially spread by humans. At up to 22 cm long, they are one of the largest frogs in the World. Their name refers to them tasting similar to chicken, and being a human food source in their natural habitat. 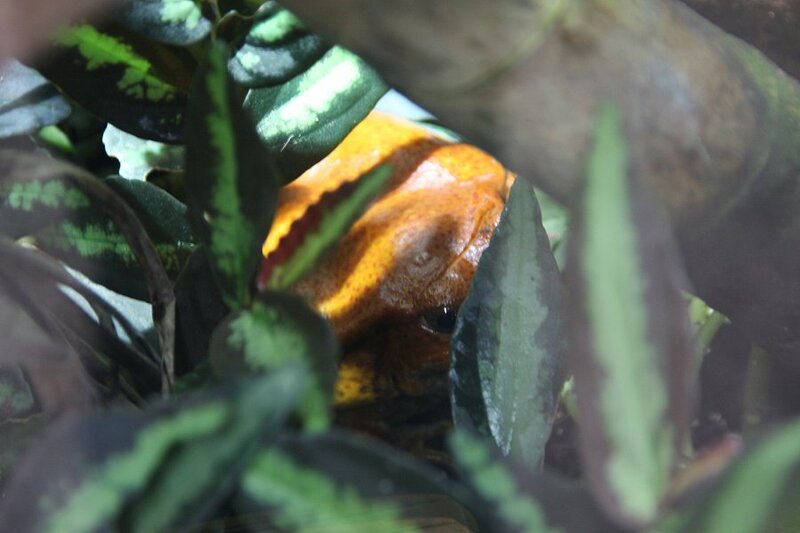 False tomato frog, a Madagascan species. And it's watching you. Rio Cauca caecilian, from South America. Appearing as a possible snake or eel, it is actually an amphibian. Like a legless salamander. It lives in streams in relatively dry areas, and like many aquatic frogs, it primarily absorbs oxygen from the water through its skin rather than breathing (even though it can). Unlike most amphibians, it is a livebearer, rather than having an aquatic larval (tadpole) stage, and therefore also does not have aquatic eggs/spawn. 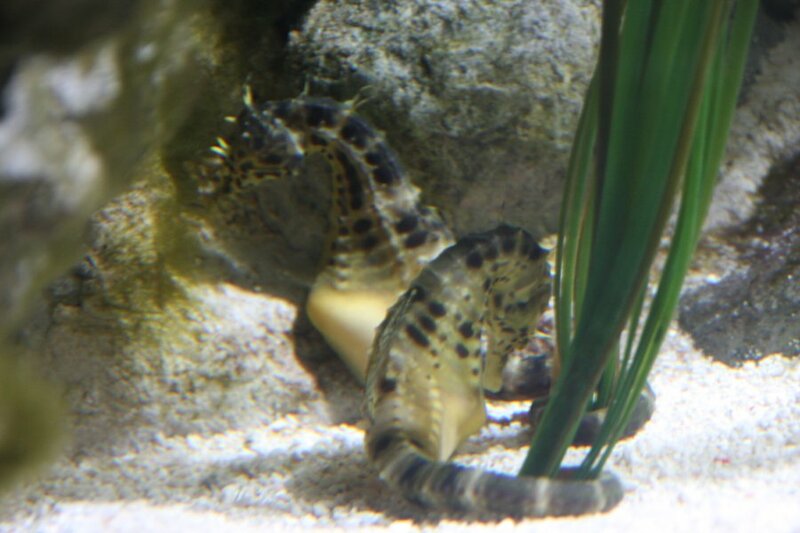 Big-belly seahorses. Judging from the curved belly on the far one, and the pointed belly on the near one, these appear to be male and female. 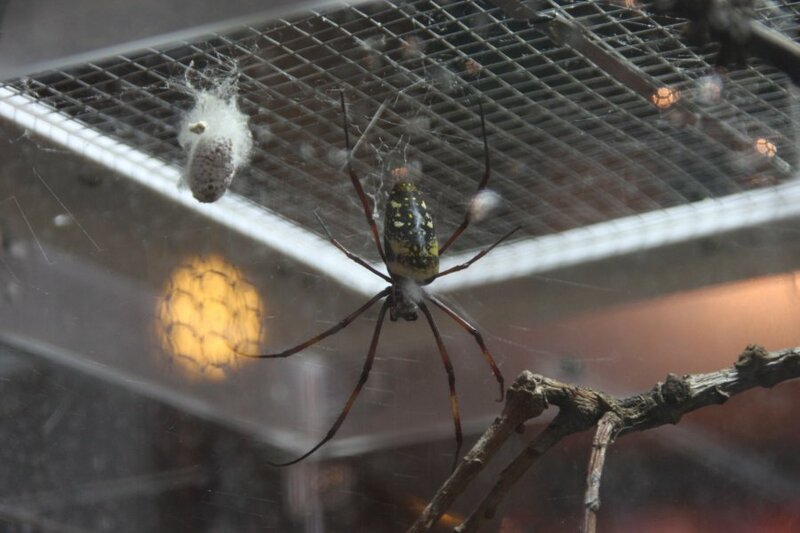 Female golden orb-weaver spider, with a leg span about the size of the palm of your hand, and an apparent egg sac. These large spiders are one of the oldest known spider types, with fossils dating back over 165 million years. Their webs are extremely thick and strong - to the point that they are visibly golden, and can catch small birds and snakes. That makes these the only known spider that actively catches birds to eat (bird-eating tarantulas actually eat bugs or rarely may scavenge carrion). Their webs are strong enough to be used to make human clothing and fishing nets, and their venom is strong enough to kill the prey it catches. The species is not identified, but it looks like Nephila comorana, from the Comoro Islands near Madagascar. 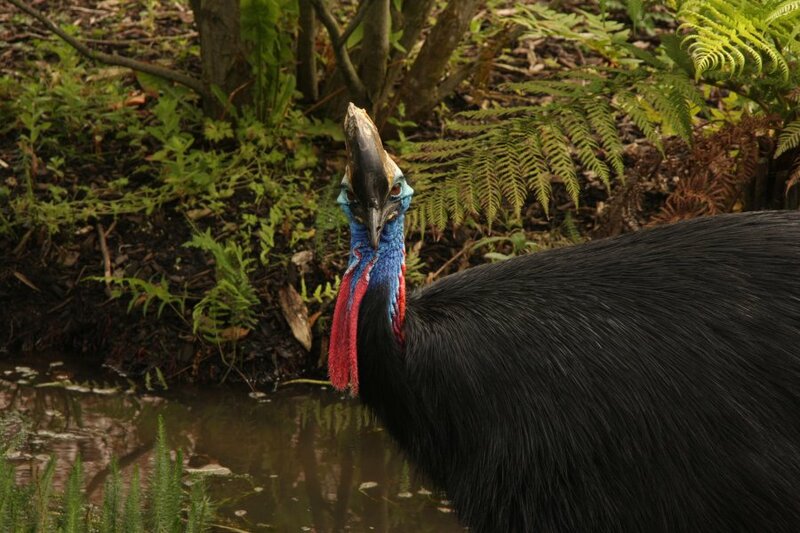 Southern cassowary, a very large flightless bird related to ostriches. These are about as close to dinosaurs as it is possible for a modern bird to be, with the same type of foot, and skeletal arrangement. Very similar to raptors. The foot is an extremely offensive weapon, and these birds use it to defend themselves if they feel threatened - this gives them a reputation for being the most dangerous birds in captivity. Drinking. 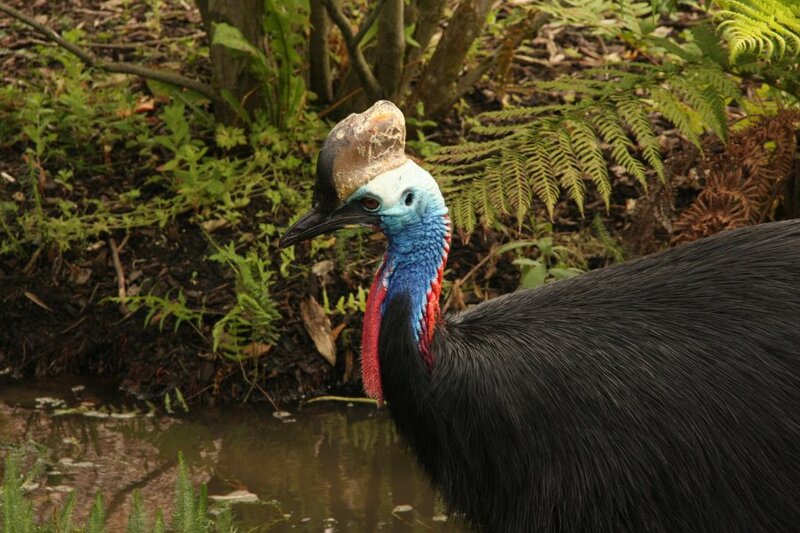 Bizarrely, ratites (cassowaries, ostriches, rheas, emus, kiwis) are one of only a few bird groups (the others being some ducks and swans) that mate using a phallus instead of a cloacal kiss. The casque (crest) is hollow, thought to be used for making sounds, or deflecting falling fruit, but its actual purpose is not conclusively known. 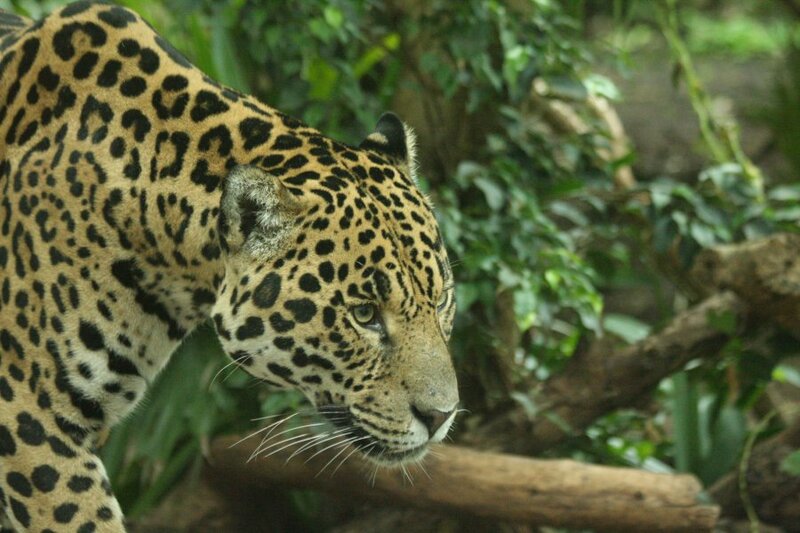 Jaguar, the largest cat in South America, and one of its major predators - the largest predatory mammal in the area (followed closely by the cougar). Despite living in completely different environments (a rainforest instead of dry savannah) and completely different continents, it looks very similar to the African leopard. 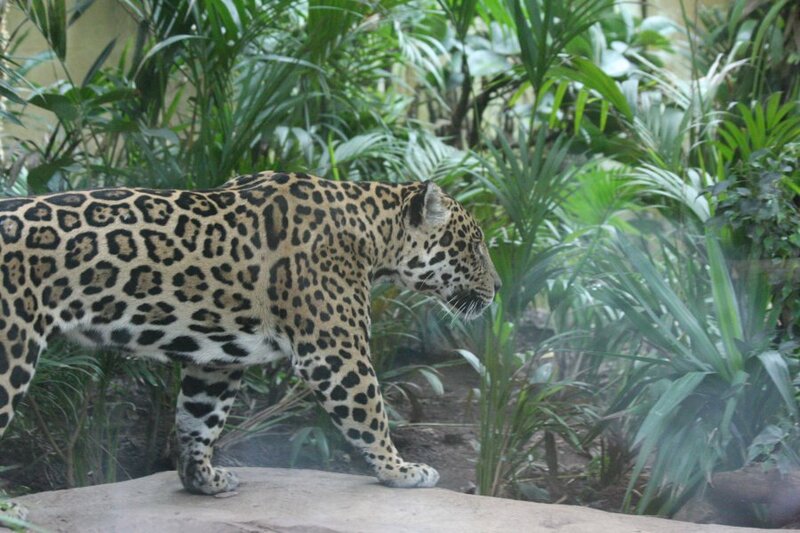 The spot patterns are significantly larger, and so is the animal itself. 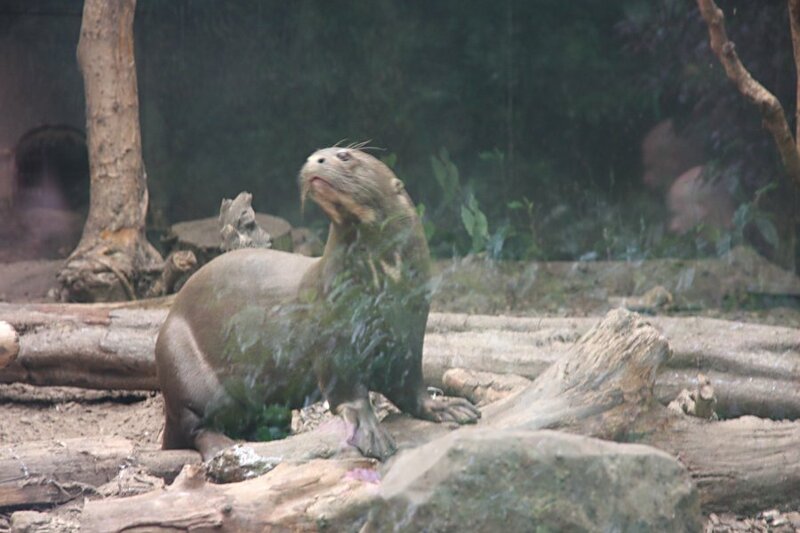 Giant otter, an endangered species from the Amazon rainforest, far bigger than our native otters. 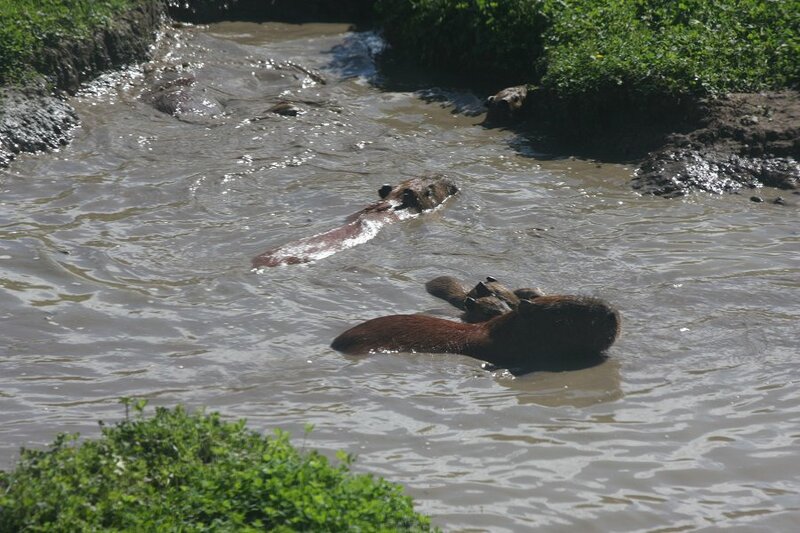 Capybara adults and youngsters, the World's largest rodent. 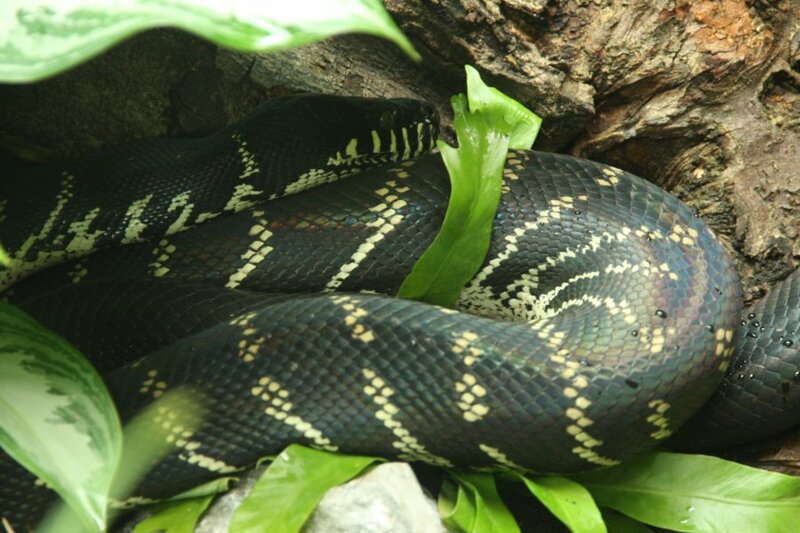 A major food source for the South American cats and giant Amazon snakes like the anaconda. 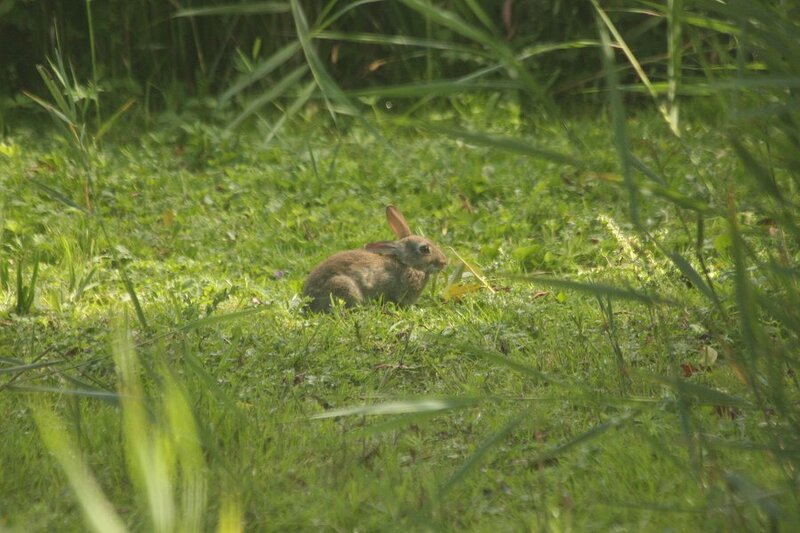 Wild rabbit, a British native. Male African lion with a bloodstained face. Female African lion licking her food clean, or something. Cheetah coalition and sentry (I did not check which subspecies these are, but they are probably African rather than Middle Eastern). 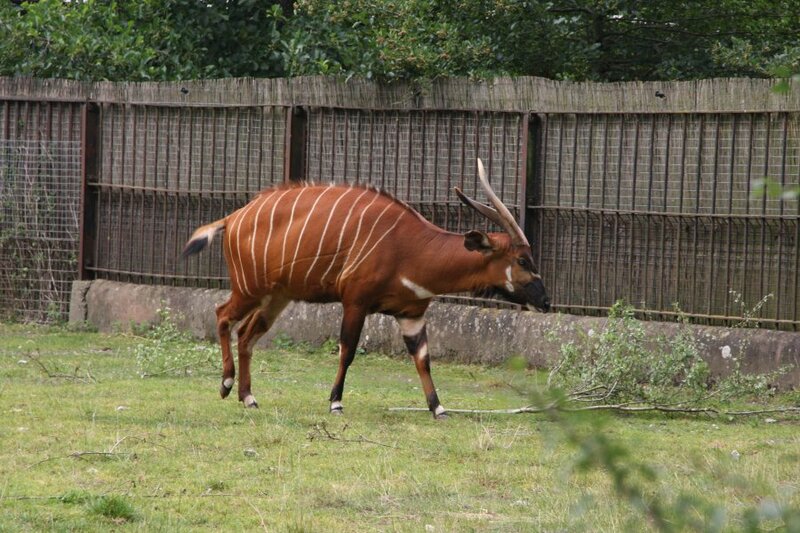 Eastern bongo, the far less common bongo, from a tiny range of mountains. Bongo ... bongo. Sorry, it's just a funny word. Bongo. 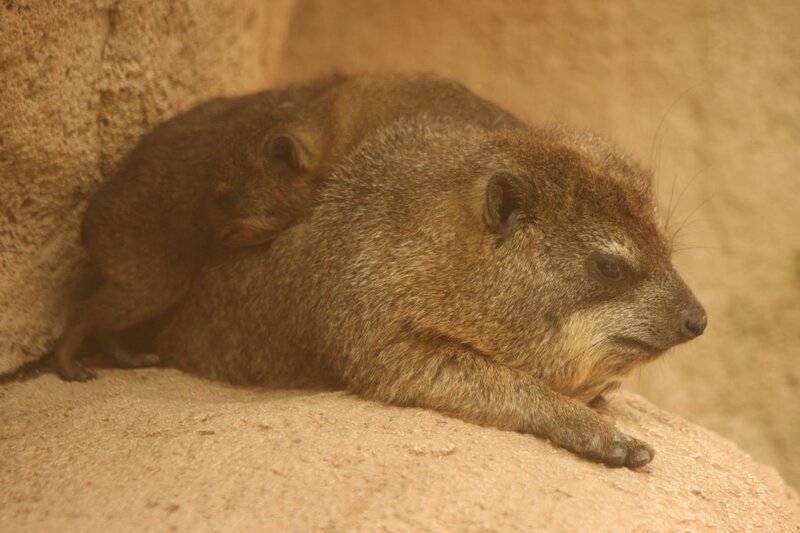 Rock hyrax mother and babies. These look superficially like groundhogs, but their closest relatives are actually elephants and manatees - they are thought to represent a very early branch of mammals. 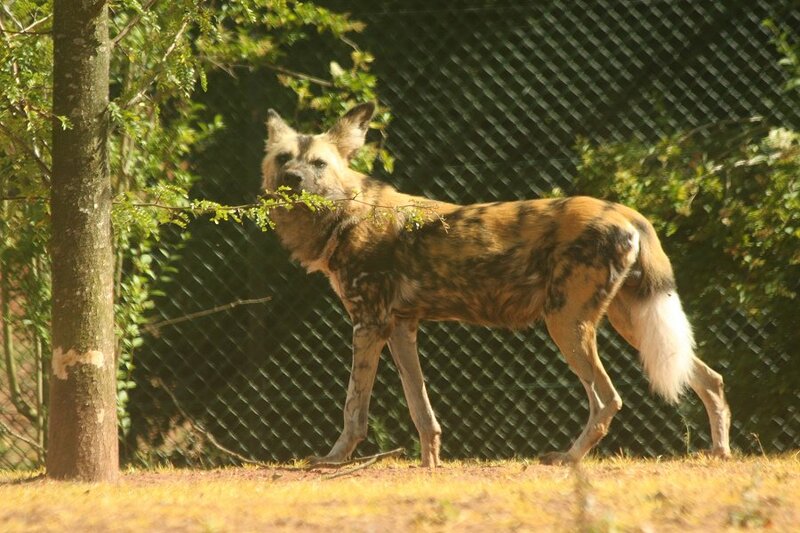 African painted dog, an endagered pack hunter. 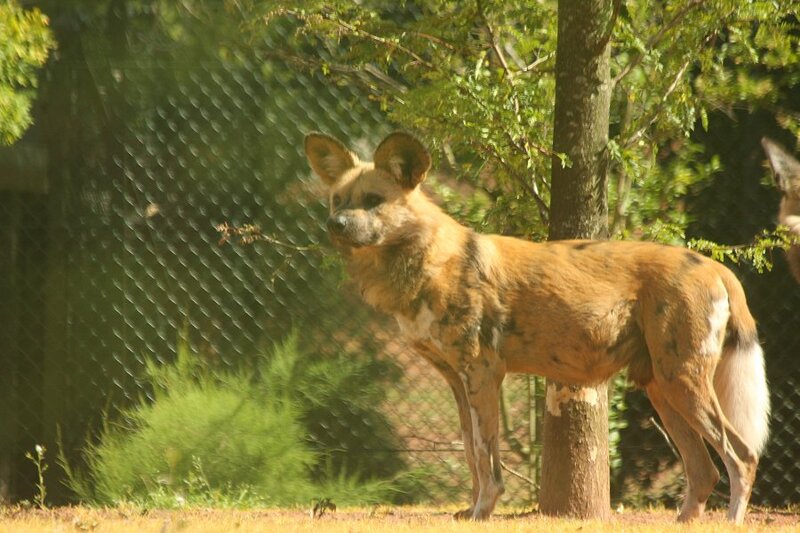 African painted dog with a different coat pattern. 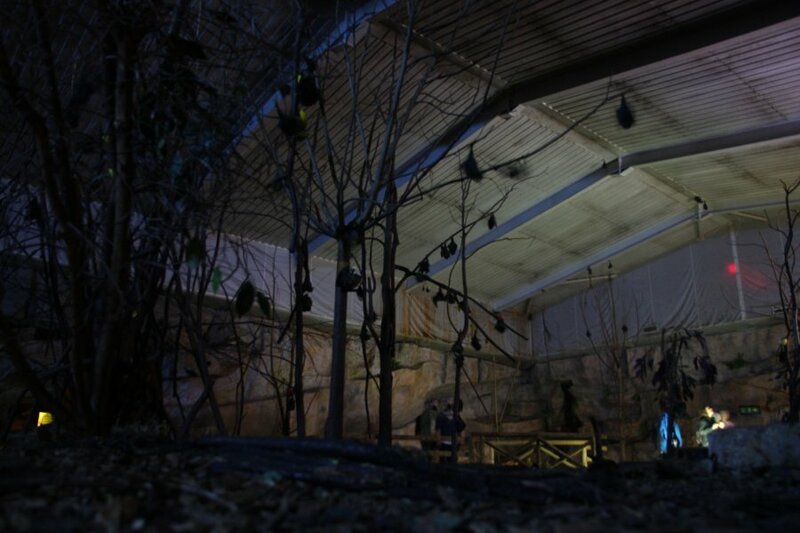 The bat room. Most are the Rodrigues fruit bat from Mauritius, but there is also a smaller species. 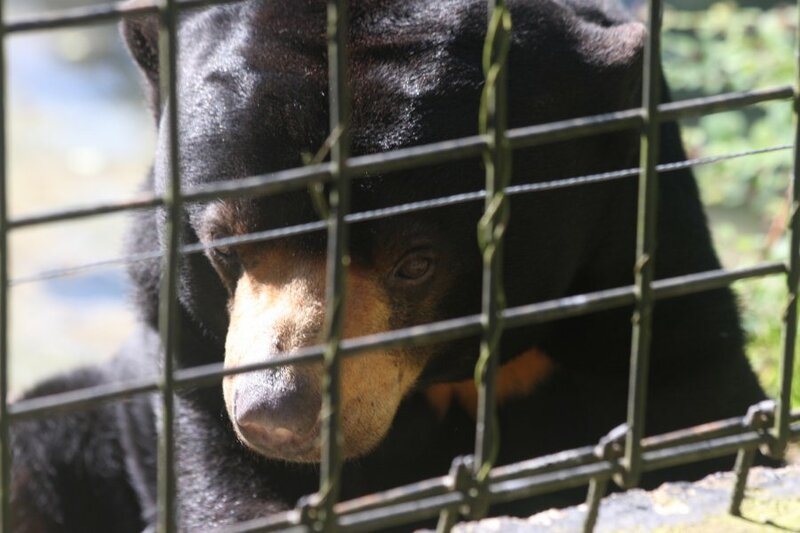 Malayan sun bear arrives from southeast Asia. 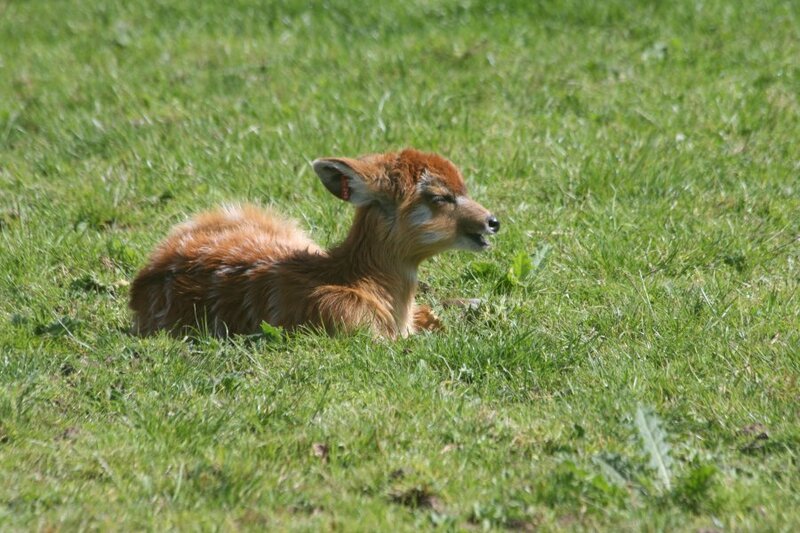 Pokes its extremely long tongue out at the passing children. 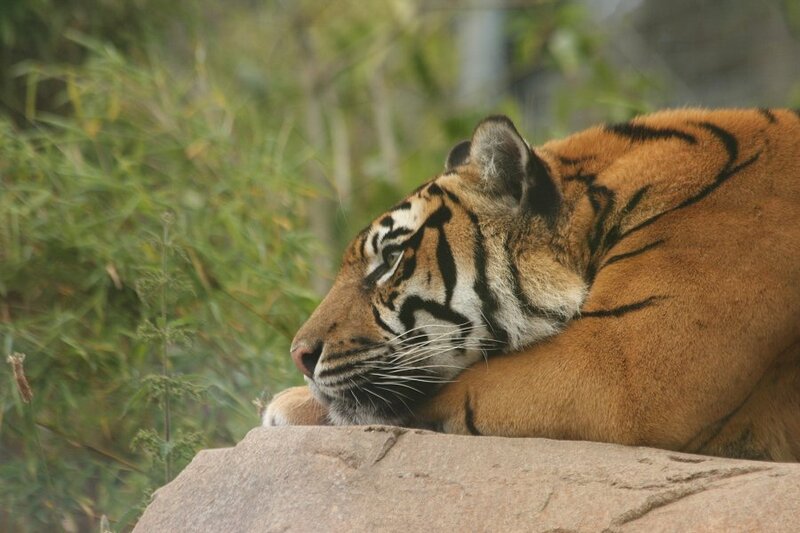 Sumatran tiger, from southeast Asia. 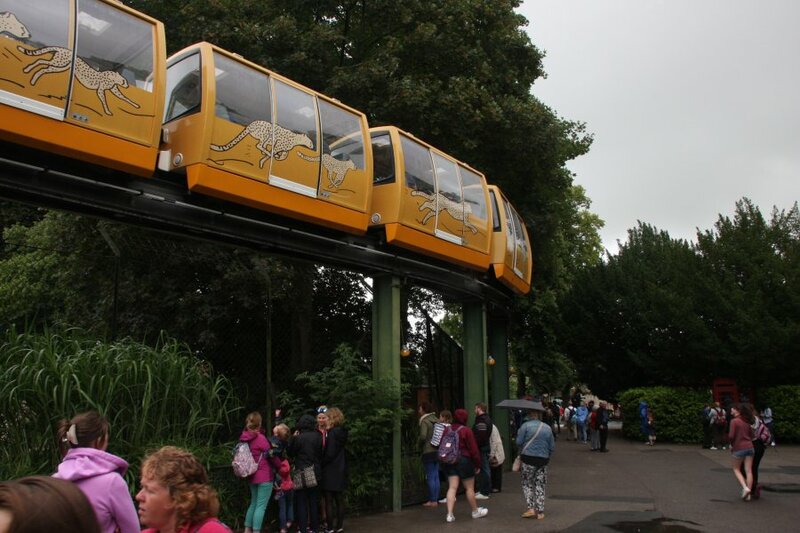 Zoo monorail, sightseeing fit for royalty - yes, our monarch has used it - calling at Brockway, Ogdenville and North Haverbrook. 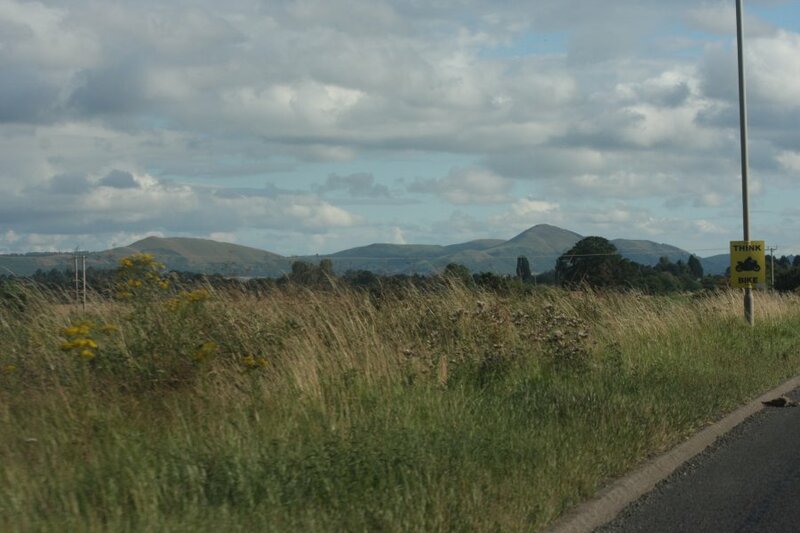 The Shropshire Hills, approaching Church Stretton. 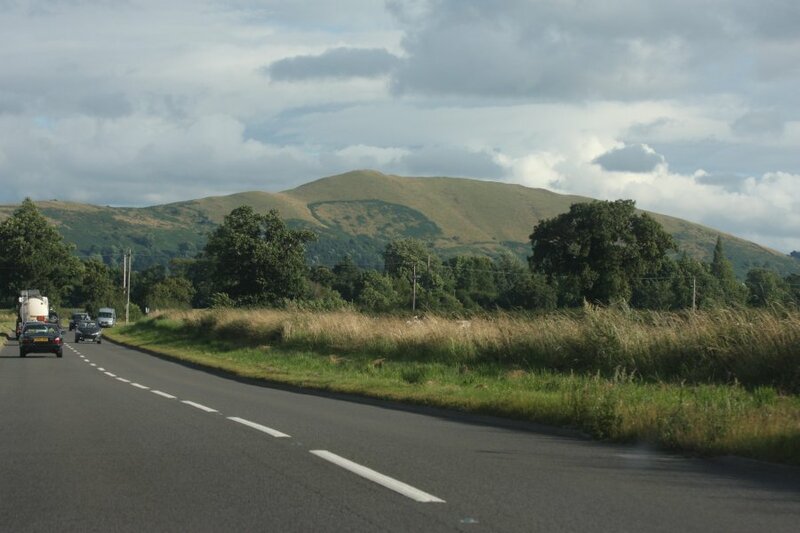 The Lawley (about 400 metres), Willstone Hill (403 metres), Hope Bowdler Hill (426 metres), Caer Caradoc Hill (459 metres).